When South Carolina created the Order of the Palmetto, the state’s highest civilian honor bestowed by the Governor’s Office, they surely had Brevard College alumnus, Charlie Stoudenmire ‘67 in mind! No one was surprised that, after a life spent serving the people of South Carolina as an educator and administrator in the public school system, Stoudenmire received the prestigious award. 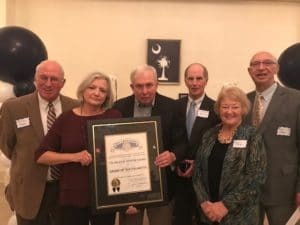 Brevard College alumni everywhere cheered this outstanding recognition, bestowed on October 27, at a special ceremony in Summerville, SC. To Stoudenmire, teaching and improving the public school system represented much more than just a job. Education was his passion and he spent every day working to help more children achieve at a higher level. “I hope and pray that I made a difference in the children’s lives that I was trying to serve,” said Stoudenmire. Stoudenmire believes the values that underpinned his long career of service started during his time at Brevard College. He credits Brevard College with giving him a chance and helping to equip him to make a difference in the lives of South Carolinians. His journey as an educator began as a classroom teacher at Aynor High School. This provided the foundation to make Stoudenmire a great administrator. His career in administration spanned Midland Elementary, Chester High School, Summerville High, Knightsville Elementary, and Spann Elementary. Stoudenmire also served as a trustee on the school board. Throughout his career, Stoudenmire received many top-tier recognitions, including the Administrator of the Year award and the Lifetime Achievement Award from the South Carolina Association of School Administration. In addition to serving the people of South Carolina, Stoudenmire is a member of the Brevard College Alumni Association Board. He has chaired several leadership committees and received the Distinguished Alumni Award, which is the highest honor bestowed by the Alumni Association. “Stoudenmire’s love for others and for Brevard College is so evident and I could not think of a more deserving person to win this award,” said Brevard College Director of Alumni Affairs, Jeff Joyce. 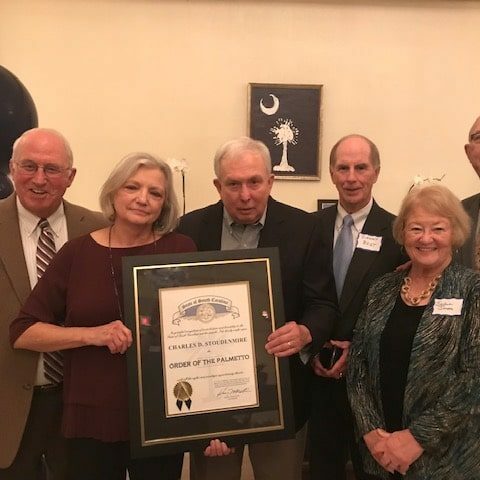 Several members of the Brevard College family (fellow alumni, faculty, and coaches) joined Stoudenmire and his wife (Shirley Stoudenmire `67) to celebrate at the Order of the Palmetto ceremony. It comes as no surprise to alumni that these friendships, begun over 50 years ago at Brevard College, continue to thrive. Stoudenmire’s life of service will certainly not stop with this award and the Alumni Association cannot wait to see what else is in store.